Vietnam spans quite a distance, changing in geography as much as cuisine as you move from north to south. Travellers taking the time for a bit of research into the unique dishes of each region will be rewarded with delicacy after delicacy. In Hanoi, it's the ever present coffee scene that steals the show. In particular, the famous egg coffee. Walk down any street, especially around the old quarter, and you’ll spot it chalked up on the menus of cafés big and small. And cafés, Hanoi knows well. The city is rife with them. Caffeine love here is very real and very much worth investigating. Upon hearing you’ve been to Hanoi, many Vietnamese locals will almost immediately jump to a single question: “Did you have egg coffee?” Their look, one of gleeful anticipation, seems to suggest they’re used to getting a fairly entertaining mix of responses. The sweet and velvety drink was invented in 1946 by Nguyen Van Giang, a bartender at the Sofitel Legend Metropole hotel who was seeking a substitute for milk which was expensive at the time. The resulting drink eventually prompted the opening of Giảng Cafe, where the sumptuous coffee continues to attract Vietnamese and travellers alike. The recipe is simple enough – prepared by whisking egg yolks, condensed milk and a touch of Vietnamese coffee to create a rich cream that sits upon fresh black coffee. At Giảng Cafe, the recipe remains secret, but with butter and cheese said to be part of it. If you’re heading to Hanoi, Giảng Café is definitely a good place to start, but don’t stop there. 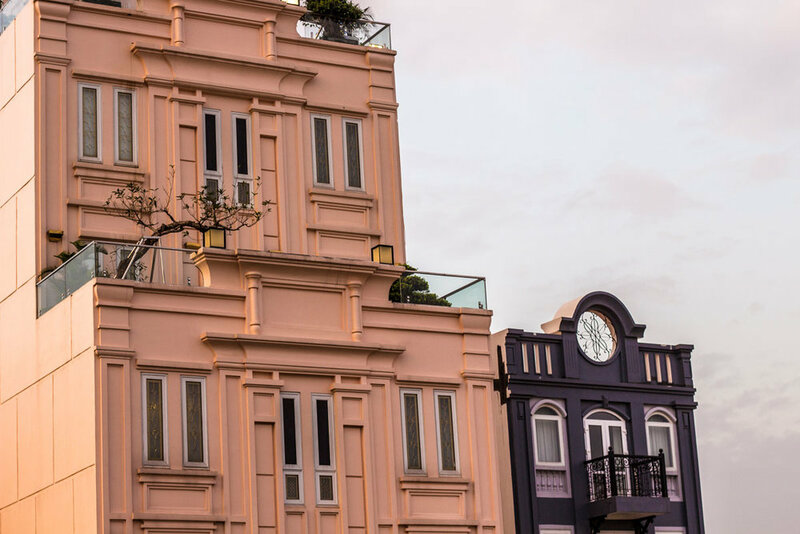 Our favourite cup came from Cham Coffee and Sandwiches (address further below), a little shop on Tống Duy Tân where you’ll find your fill of cafés, restaurants, juice bars and more. If you aren’t heading to Hanoi any time soon, Jodi of Legal Nomads snagged a recipe from her Hanoi host family which you can check out here. Right up there with egg coffee, yogurt coffee is a delightful way to get your morning mojo. Intense Vietnamese coffee is served on ice with sweet, thick yogurt. The resulting concoction is an unusual but addictive treat that’s perfect on steamy Hanoi morning. Sitting a short walk from the old quarter in a quiet alley, you’ll find a street lined with, you guessed it, BBQ chicken vendors. Towards the back, the biggest establishment grills fowl feet, breasts and more, along with pork intestine, veg and Vietnamese buns pressed and coated in honey syrup. If you’re lucky, your BBQ neighbours will take you out for delicious Vietnamese ice desserts to wrap up the night. 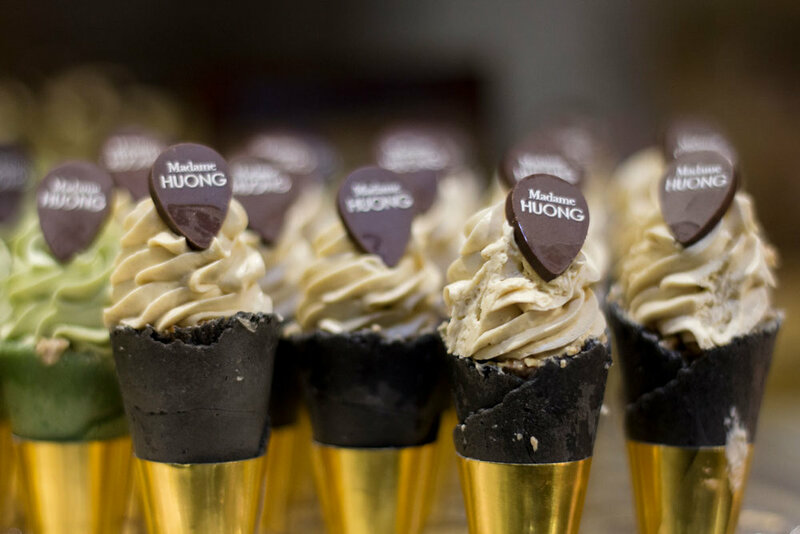 Even if not, you’ll easily find a sweet treat from the many bakeries open late throughout Hanoi. 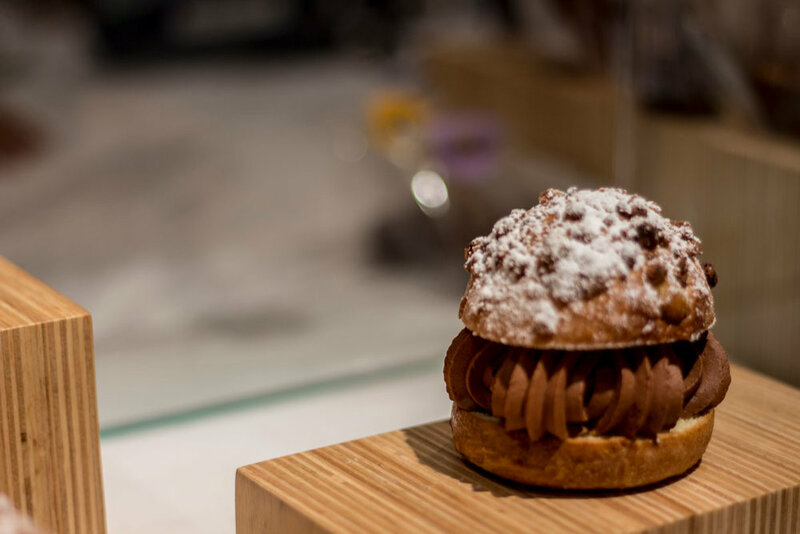 Go for a walk and find one that has just the perfect pastry for you and enjoy. 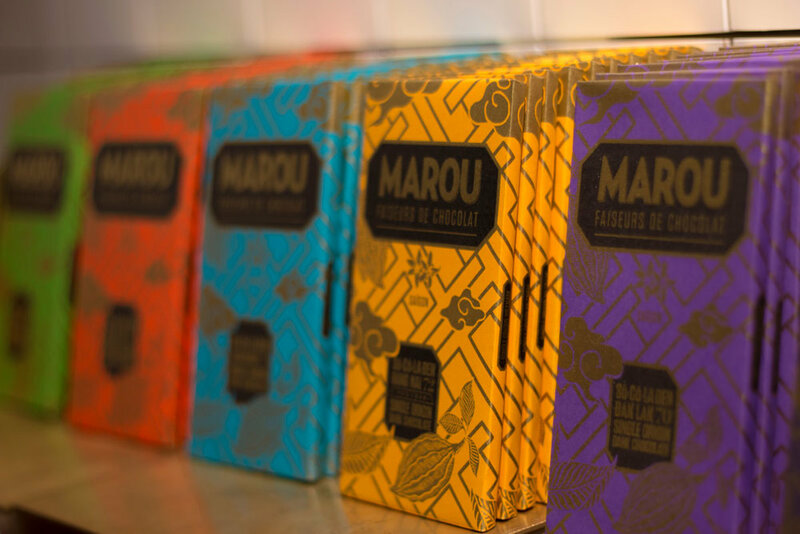 Marou Faiseurs de Chocolat makes bean to bar chocolate just outside of Ho Chi Minh City that highlights Vietnam’s diverse terroir and have also opened shop in Hanoi. Pop into the beautiful cafe to find a few tasty treats to bring home and (maybe) share with loved ones. Crossing the road in Hanoi can feel like a game of extreme frogger. Locals tell us the secret is to not make eye contact and charge ahead. Test at your own risk. Or better yet, treat yourself to a leisurely stroll around Hoan Kiem Lake where motor vehicles are prohibited on weeknd evenings. As any big city, Hanoi is filled with cheap places to grab some Zs. We found a couple great Airbnbs in the old quarter, here and here (and get a credit here if it’s your first time). That said, we’d suggest looking a little out of the quarter. The chaos of the old quarter might be charming for a minute, but the hassle of traffic (seemingly the worst in the city) and very persistent vendors, looses its appeal quickly. Especially at 8am when your smoothie is waiting on the other side of the road. While we’re on the subject, we beg of you, leave the old quarter. A short walk in any other direction and we found a city with much more to offer than most travellers seem to see. So please, go get lost.